With much festivities and as promised, Apple has opened one of its largest retail outlet in Asia. The West Lake Apple Store is located in Hangzhou, China is one of the five outlets (second in line) to be launched in China before February 19th, the Chinese New Year. The first of the five outlets were opened earlier this month at Zhengzhou, Central China. The West Lake Apple Store is offering a Genius Bar, floor space of workshops and One to One personal training. According to Apple Insider, lectures are scheduled to start today on iPhone, iPad, Mac and iMovie for OS X. Prior to the opening of the West Lake Apple Store, Apple has been teasing their grand opening here with the amazing mural by artist Wang Dongling, an artist specializing in calligraphy. 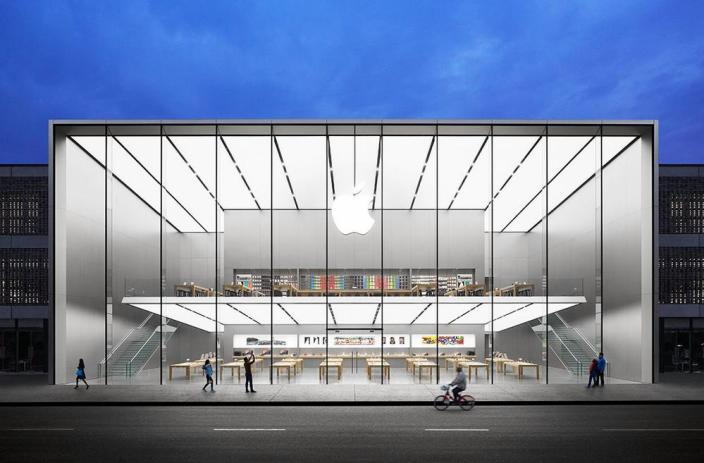 The store was covered with white protective barriers bearing the ancient Chinese poem “Praising West Lake in the Rain” and an illuminated Apple logo in the middle. Apple CEO Tim Cook tweeted: “Starting Something New in Hangzhou, China!” followed by the hashtag #AppleStoreWestLake; a rare act done by Tim to promote the newly opened store. Apple has been working hard to gain market in China where Xiaomi has a strong customer base along with Samsung. According to Angela Ahrendts, Apple SVP of Retail, along with the 5 stores to be opened before the Chinese New Year, they are planning to open 25 retail stores in China by the end of 2016.